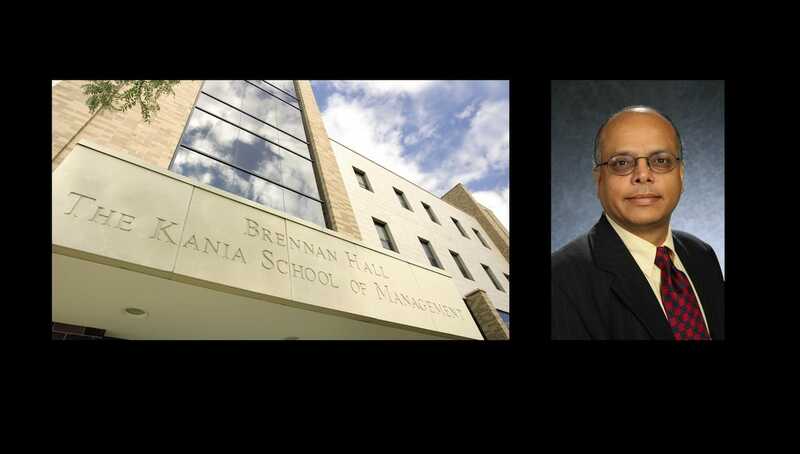 Sam Beldona, Ph.D., has been named dean of the Kania School of Management effective July 1, 2019. University of Scranton President Rev. Scott R. Pilarz, S.J., announced the appointment of Sam Beldona, Ph.D., as dean of the Kania School of Management effective July 1, 2019. Dr. Beldona has served as dean of the Barowsky School of Business at Dominican University of California, since 2013. At Dominican University, Dr. Beldona launched a three-day MBA Bootcamp experience and implemented a required Global Consulting Practicum for MBA students. Also, working with faculty and staff, he led an effort that resulted in the appointment of a placement director, significantly increasing the percentage of students who completed internships within the school of business. At Bryant University in Smithfield, Rhode Island, Dr. Beldona served as associate dean and tenured associate professor at the Graduate School of Business from 2011 to 2013, and as chair of the Management Department in the College of Business from 2007 to 2011. At Bryant he helped the faculty to introduce new courses, such as Global Human Resource Management, International Business Practicum and Managing Diversity in a Global Environment. In addition, with faculty support, he introduced highly-interactive modules in each of the required courses for undergraduate students that included service learning, internships and case competitions. At the graduate level, he introduced specializations in global supply chain management, international business and global finance. Previously, Dr. Beldona served as the Larry Jones Fellow of Corporate Governance at Wichita State University from 2001-2007, where he also served as the entrepreneurship research associate for the Center for Entrepreneurship. Dr. Beldona was an associate professor of international business at the International University of Japan from 2000-2001. He was an assistant professor of international business at Rutgers University from 1994-2000. In addition, Dr. Beldona has extensive experience with AACSB International (The Association to Advance Collegiate Schools of Business) accreditation, having been a member of school’s AACSB’s Accreditation Steering Committee, Strategic Management Committee and Faculty Qualifications Committee, among others. The University’s Kania School of Management holds AACSB International accreditation. Dr. Beldona has lectured, consulted, studied and taught in the Americas, Asia and Europe, and since 2003 has served as a visiting professor of corporate strategy at Temple University Japan, in Tokyo, Japan. Dr. Beldona earned his bachelor’s degree and MBA from Karnatak University in Dharwad, India, and his master’s and Ph.D. from Temple University.